It was precisely after the crumbling of that empire, mortally wounded by the Napoleonic wars and by the loss of most of its American colonies, that Amalia was born. The day was November 10, 1835. On the throne of Spain sat a young girl, Isabel II, with her mother Maria Cristina, as the regent. This reign was becoming an extremely perturbing period, noticeable by ministries of short duration, the religious crisis, epidemics and civil war – the Carlist wars – whose side effects were still to be felt in the following century. The direct results of so many difficulties affected the economy. Poverty characterized the life of the majority of the population. It was in such a problematic environment that Amalia Doming Soler spent her childhood; a childhood that could not be considered a happy one. Even before she was born, she would be facing a great loss. Her father departed on a great trip and was never to return. At the age of eight she became blind, but three months later her sight improved because of the treatment she received from a pharmacist. 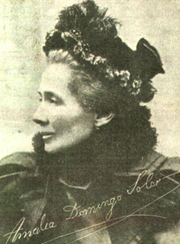 Domingo Soler – “My Life”) Amalia wrote her first poems at the age of ten, and at eighteen she published her first verses. for Amalia. The alternatives proposed by some of her relatives were impossible for her to accept: either to go to live in a convent, or to accept an arranged marriage to a much older gentleman, in a good financial situation. causing a tremendous impression upon her. the followers renewed her inner disposition, filling her heart with renewed faith and comfort in her trust in Jesus. that the doctor was a materialist, but he mentioned Spiritism to her in order to offer her some comfort for her afflictions. along with a book that he had written (“Preliminary of Spiritism”). Spiritist Movement, participating in their meetings. It was in March, of 1875 – the celebration of Kardec’s discarnation – that in the room of the Spanish Spiritist Society, in the presence of its members, Amalia reads her poem, “To the memory of Allan Kardec.” From that moment on, she joins the lines of the disseminators of the Spiritist Doctrine. She was a great writer; her work touched both heart and reason, and her extraordinary spirit conquered once and for all the sympathies of the Spanish spiritists. Fernandez Colavida, sent her, as a present, the collection of books of Allan Kardec. The spiritists of Alicante invited her to remain with them, under their protection so that she could dedicate herself entirely to the dissemination of Spiritism.